Asp.Net Zero (v5) has been scanned for vulnerabilities with the latest version of OWASP ZAP (v2.7.0). The OWASP Zed Attack Proxy (ZAP) is one of the world's most popular security tools and is actively maintained by hundreds of international volunteers. The automated scanner has been reported several alerts. Asp.Net Zero Team has fixed the positive alerts regarding the report. On the other hand most of the alerts can be stated as false-positive. The reasons for the false-positive alerts that are subject to these issues are clearly stated below. The Path Traversal attack technique allows an attacker access to files, directories, and commands that potentially reside outside the web document root directory. The report has stated some CSS, JS links are open to path traversal attack. But these alerts are false-positive. You can see the reasons why they are evaluated as false-positive. When we inspect the below response, it returns etc only in comments. And this is exactly not a path. When we inspect the below response it returns [drivers] as array. And this is not a path as well! If your application has to accept input file names, file paths, or URL paths, you need to validate that the path is in the correct format and that it points to a valid location within the context of your application. To prevent a malicious user manipulating your code's file operations, avoid writing code that accepts user-supplied file or path input. If you must accept file names as input, use the full name of the file by using System.IO.Path.GetFileName. If you must accept file paths as input, use the full file path by using System.IO.Path.GetFullPath. If you use MapPath to map a supplied virtual path to a physical path on the server, use the overload of Request.MapPath that accepts a bool parameter so that you can prevent cross-application mapping. SQL Injection refers to an injection attack wherein an attacker can execute malicious SQL statements (also commonly referred to as a malicious payload) that control a web application's database server. Asp.Net Zero uses Entity Framework as data access technology. And Entity Framework uses parameterized queries which prevents SQL injections by default. Do not trust client side input, even if there is client side validation in place. Check all data on the server side. Always use parametrized queries when you use directly T-SQLs or Stored Procedures. Cross-site Scripting (XSS) is an attack technique that involves echoing attacker-supplied code into a user's browser instance. When you return a HTML content page, be sure that you encode the response. Before putting untrusted data inside an HTML element ensure it is HTML encoded. Never put untrusted data into your HTML input, unless you follow the rest of the steps below. Untrusted data is any data that may be controlled by an attacker, HTML form inputs, query strings, HTTP headers, even data sourced from a database as an attacker may be able to breach your database even if they cannot breach your application. Before putting untrusted data into an HTML attribute ensure it is HTML attribute encoded. HTML attribute encoding is a superset of HTML encoding and encodes additional characters such as " and '. Before putting untrusted data into a URL query string ensure it is URL encoded. The X-Frame-Options HTPP header can be used to indicate whether or not a browser should be allowed to render a page in a <frame>, <iframe> or <object> . Sites can use this to avoid clickjacking attacks, by ensuring that their content is not embedded into other sites. ASP.NET Zero uses ASP.NET Boilerplate framework. After version 3.4.X, the framework adds X-Frame-Options header to all responses with the value SAMEORIGIN. If you want to remove the header you can do it via UseAbp() options in Configure method of Startup class. The X-Content-Type-Options HTTP header is a marker used by the server to indicate that the MIME types advertised in the Content-Type headers should not be changed and be followed. This allows to opt-out of MIME type sniffing, or, in other words, it is a way to say that the webmasters knew what they were doing. ASP.NET Boilerplate framework v3.4.X adds the X-Content-Type-Options header to all responses with the value nosniff. If you want to remove the header you can do it via UseAbp() options in Configure method of Startup class. A Format String error occurs when the submitted data of an input string is evaluated as a command by the application. The instances of this attack is false-positive. Because this attack vector is applicable for C programming language. In ANSI C, conversion functions, like printf, fprintf, converts a primitive variable into a human-readable string representation. For C# this alert can be safely ignored. 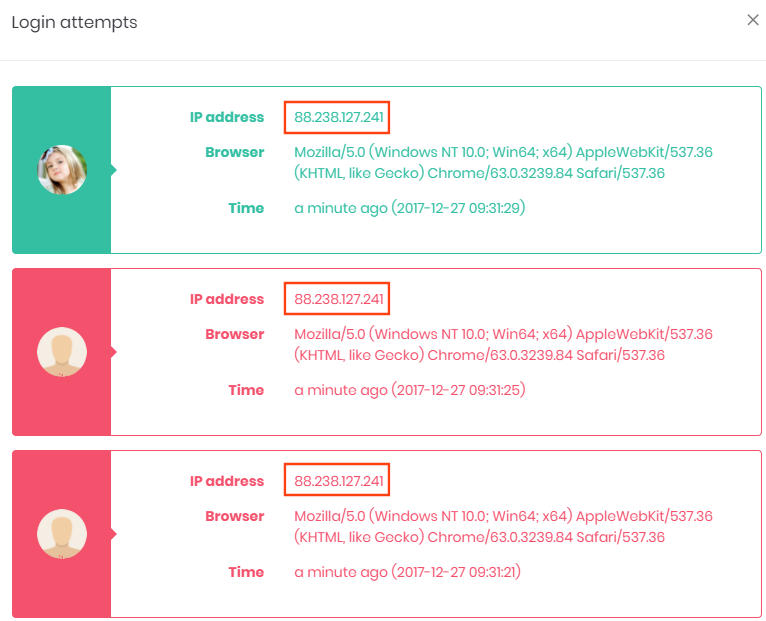 If a page contains an error/warning message that may disclose sensitive information, this can be used to launch further attacks against the web application. This is false-positive alert. As seen in the below screenshot, Asp.Net Zero returns a HTPP 500 Internal Server Error without any sensitive information. 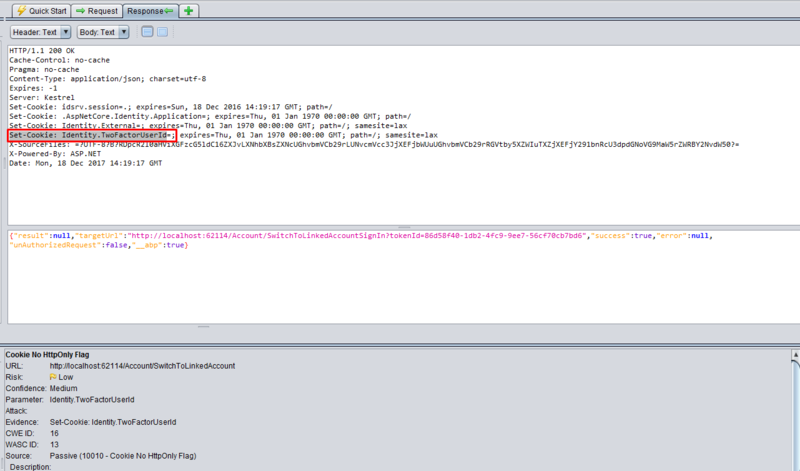 While the error detail is not being sent to the client, it is logged on the server. Asp.Net Zero never returns error details, if only developer sends it deliberatively. When the project runs on development, exceptions are being sent to client. 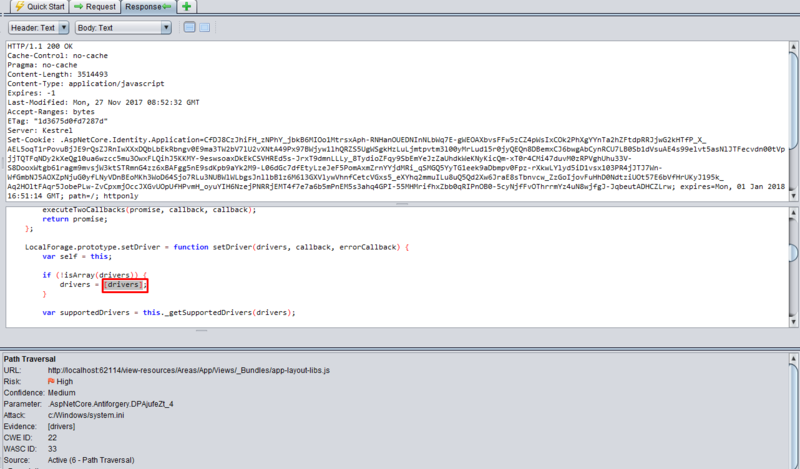 But publishing application in release mode prevents exception details to be sent. While MVC project shows a custom error page, Host project sends a JSON with message "An internal error occurred during your request!" Asp.Net Zero uses HttpOnly flag wherever it needs. In some cases the tool reports false-positive alerts. See the following instances to understand why they are false-positive. 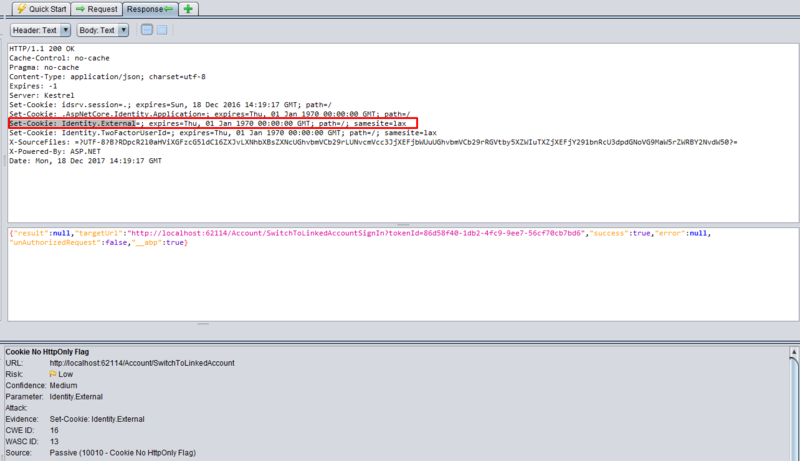 In the above request, idsrv.session cookie is being set by Microsoft Identity Server. By design this is not HttpOnly . It is required by the OIDC session management spec for SPA clients. For the related spec see https://openid.net/specs/openid-connect-session-1_0.html#ChangeNotification . Setting XSRF-TOKEN as HttpOnly is pointless because in Angular UI client must access this cookie. 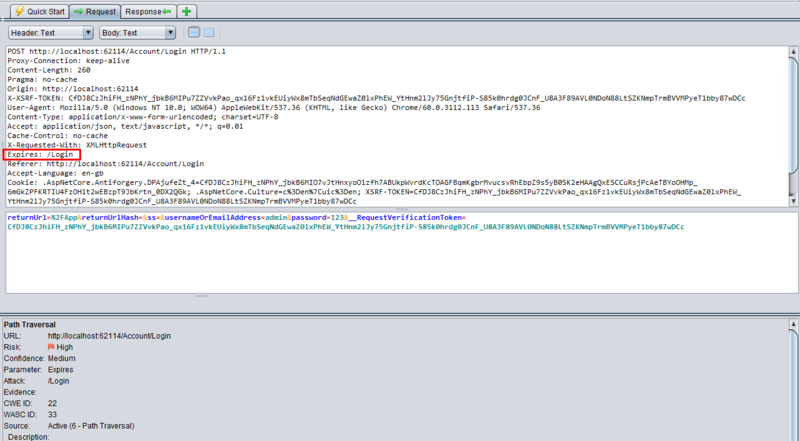 This is a false-positive too because set cookie is removing Identity.TwoFactorUserId with an empty value. This is also false-positive because it removes the cookie with an empty value. It's false-positive as well because same as above instances it's removing cookie with an empty value. As of v3.4.X of ASP.NET Boilerplate framework this cookie is being set as HttpOnly. Web Browser XSS Protection is not enabled, or is disabled by the configuration of the 'X-XSS-Protection' HTTP response header on the web server. 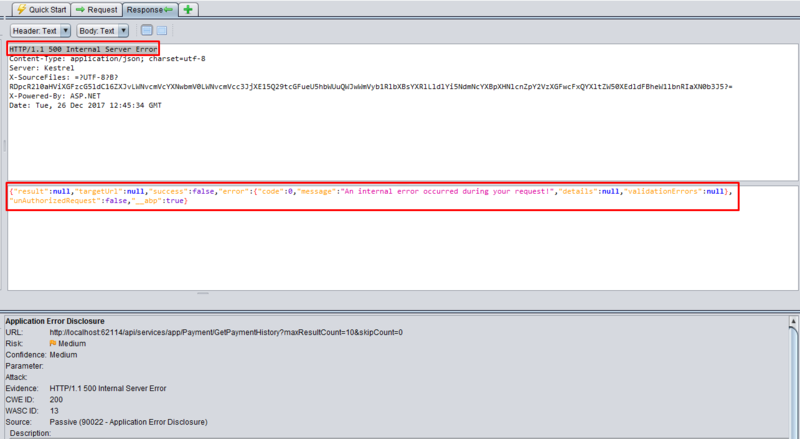 Asp.Net Boilerplate framework v3.4.X adds the X-XSS-Protection header to all responses with the value 1; mode=block. If you want to remove the header you can do it via UseAbp() options in Configure method of Startup class. A private IP (such as 10.x.x.x, 172.x.x.x, 192.168.x.x) or an Amazon EC2 private hostname (for example, ip-10-0-56-78) has been found in the HTTP response body. This information might be helpful for further attacks targeting internal systems. Asp.Net Zero has a feature that shows login attempts to the authenticated user. This is a modal dialog which can be reached by clicking profile picture at the top-right of the page. In the login attempt dialog it's shown last 10 logins with IP addresses. This private information can be seen if only the user is logged-in. And users can only see their own records! For all the other OWASP standardizations, download the OWASP sheet.